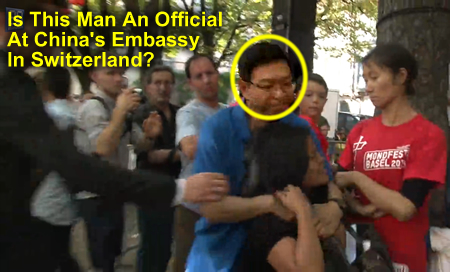 Have Switzerland’s Chinese Embassy Staff Assaulted Tibetan Protesters? Basel Switzerland Sunday September 7 at a China-related public event Tibetans staging a peaceful protest are assaulted by Chinese individuals, their right to dissent violently denied in a country that prizes its commitment to, and enjoyment of human rights. Who are those persons who perpetrated what looks very much like a case of criminal assault? Well given it was a promotion relating to China it would, as are virtually all such events, been authorized and organized with the knowledge and active support of the Chinese Embassy. 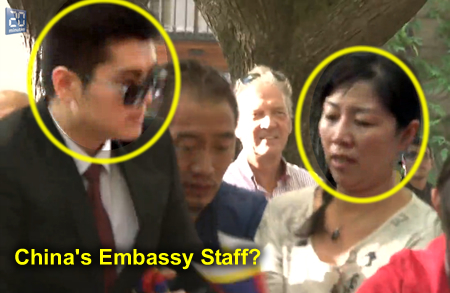 This raises the question if those who assaulted those Tibetans were Embassy or Consular staff? It would not surprise anyone with a knowledge of how China’s regime operates in regard to the issue of Tibet or human rights. It’s hoped that the local police have been informed and charges made, as such behavior is entirely unacceptable, people have the right to free speech, and the behavior on display in Basel only serves to remind the world how vicious and censorial China is to any dissenting voice. We are appealing to Mr. Didier Burkhalter Head Switzerland’s Federal Department of Foreign Affairs (FDFA) to arrange an urgent investigation into this incident to establish more conclusively if those who carried out this assault were in any way linked with the Chinese Embassy or Consular Offices. If so we urge the FDFA to request Ms. Zhu Bangzao, the Chinese Ambassador, to provide an explanation and issue an apology for the disgraceful behavior of her officials. While diplomatic immunity may protect such individuals from police prosecution we would hope that Mr Burkhalter will uphold values of freedom of speech and right to peaceful protest and agree that such oppressive scenes are not welcome in Switzerland. In that context we call upon his office to launch an immediate investigation and make clear to the Chinese authorities his concerns. Respected sir, I am disappointed of the misbehavior of Chinese ambassy officials or Chinese individual towards Tibetans who staged a peaceful protest as by right law of your nation. 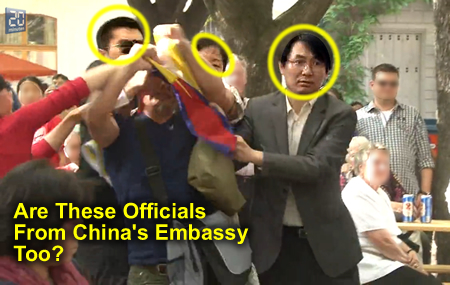 I saw some images in which the ambassy officals and pro-chinese nationalist assulted in a disgusted manner. Plz investigate this issue and take a right action as soon as possible. Thank you! An Assault to a peaceful protester is a grave violation of freedom of speech and right to freedom of protest and the culprit should be fully persecuted. ← Everyone Knows It’s A Deception But Conformity Ensures Compliance!